SUMMARY: We present a case of increased fluid-attenuated inversion recovery signal intensity in the subarachnoid spaces on 6-hour delayed enhanced MR imaging in a patient with posterior reversible encephalopathy syndrome (PRES) in the setting of acute hypertensive encephalopathy. This hyperintensity was believed due to CSF gadolinium enhancement, a finding that would be anticipated in light of the suspected pathogenesis of increased microvascular permeability in PRES. Posterior reversible encephalopathy syndrome (PRES) is theorized to result from an abnormally leaky blood-brain barrier (BBB) at the level of the microvasculature. MR perfusion studies to date have unsuccessfully clarified the site of abnormally increased vascular permeability as capillary, arteriolar, or venular.1 Increased permeability to small molecules such as water explain the interstitial accumulation of fluid in areas affected by PRES; however, larger molecules such as gadolinium chelates might also cross an abnormally permeable BBB. Because this leak may occur slowly for minutes to hours, it is difficult to capture with dynamic contrast-enhanced perfusion techniques or even immediate postcontrast sequences. We report a case of abnormal fluid-attenuated inversion recovery (FLAIR) hyperintensity in the subarachnoid spaces in a patient with PRES and normal renal function. The hyperintensity was due to delayed CSF gadolinium accumulation, a finding that supports the concept of slow BBB leakage in this syndrome. A 77-year-old woman with a medical history significant for chronic hypertension and dementia presented to the emergency department with headache, obtundation, and markedly elevated blood pressures as high as 230/120 mm Hg. Unenhanced FLAIR imaging of the brain performed at this time demonstrated extensive confluent areas of white matter hyperintense signal intensity in both cerebral hemispheres (Fig 1). Diffusion-weighted images and apparent diffusion coefficient maps (not shown) demonstrated increased diffusion in the affected areas and no restricted diffusion. The clinical presentation and MR imaging findings were consistent with PRES in the setting of hypertensive encephalopathy. Axial FLAIR image from the patient's first MR imaging examination demonstrates confluent juxtacortical and deep white matter T2 hyperintensity in the bilateral frontal, posterior parietal, and occipital lobes characteristic for PRES. 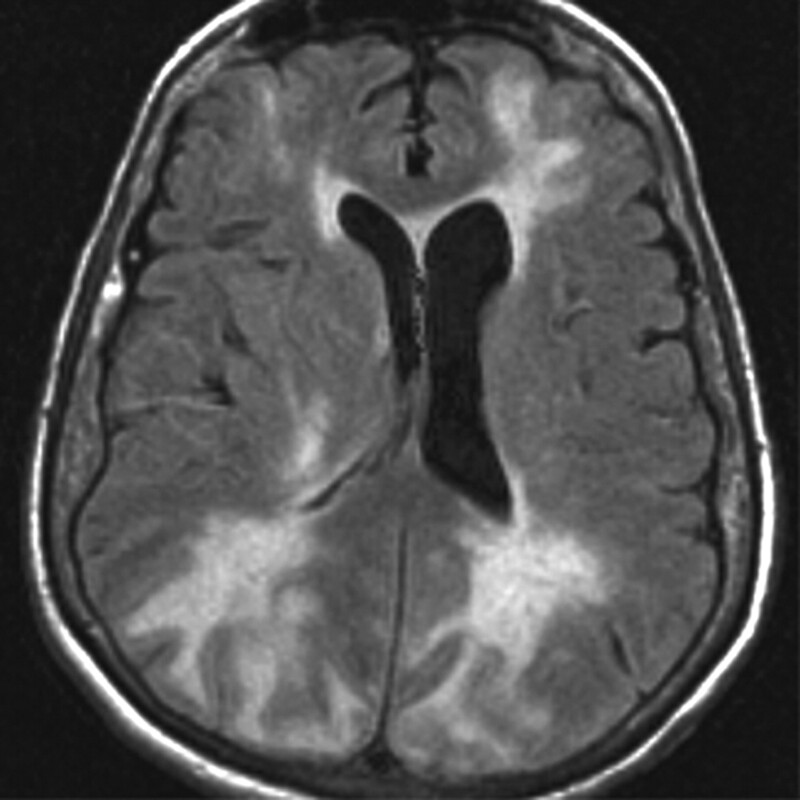 Note the normal hypointense appearance of subarachnoid space fluid. The patient underwent a second contrast-enhanced MR imaging examination, including perfusion imaging 6 hours later on the same date. Axial FLAIR images of the brain obtained immediately following the second dose of contrast revealed markedly elevated signal intensity throughout the subarachnoid spaces, which had not been present on the first study (Fig 2). 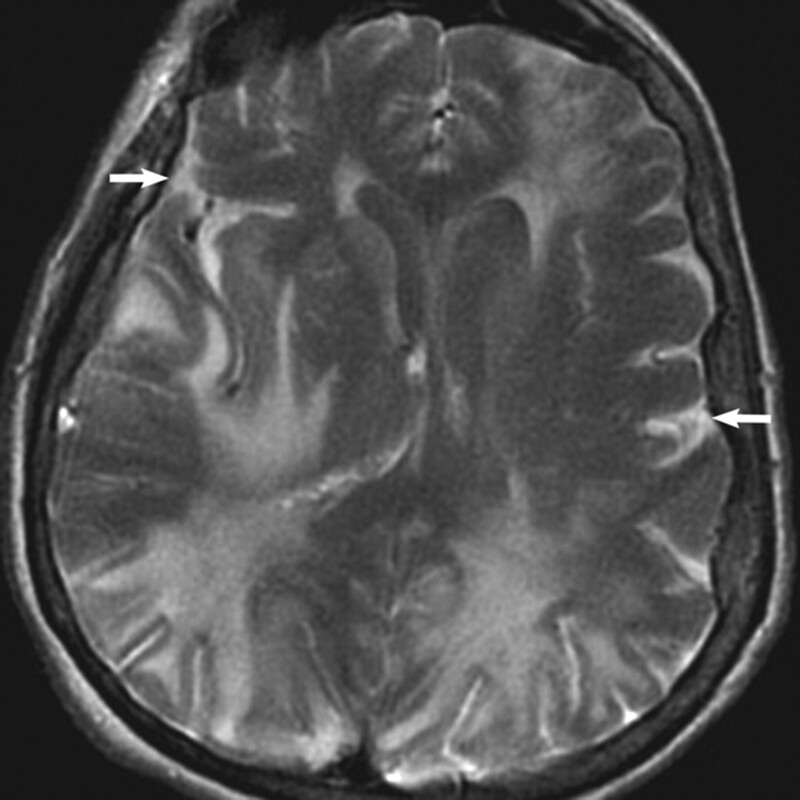 CT was not performed due to no clinical concern for subarachnoid hemorrhage and given the normal-appearing FLAIR images at the time of initial presentation and imaging. A CSF assay for gadolinium was also not performed to confirm the suspicion that FLAIR hyperintensity was due to enhancement because no other indications for the procedure were sufficient to warrant consideration of this mildly invasive test. The patient's admission and subsequent laboratory values revealed no evidence for renal compromise throughout her course, with serum creatinine levels ranging between 0.7 and 0.8 mg/dL. Most previously reported cases of CSF gadolinium enhancement in clinical patients are seen in conjunction with higher than usual contrast doses and in the setting of poor renal clearance. Most of these cases seem to require coexisting CNS pathology from ischemic, neoplastic, or inflammatory/infectious causes.9–12 Higher circulating plasma levels of contrast alone are not expected to affect BBB permeability, but likely lower the threshold for enhancement detection on FLAIR. A delay in imaging of a few hours may be important to detection because extravascular leakage of gadolinium is not instantaneous. The relatively slow rate of fluid exchange with the interstitial compartment and/or CSF requires time to occur. During this patient's admission, her clinical course was notable for difficult-to-control refractory hypertension requiring multiple-drug therapy to reduce blood pressure, including nitroprusside drip in the neurointensive care unit. Dilated funduscopic examination demonstrated changes of moderate hypertensive retinopathy. One day following admission, the patient's neurologic abnormalities had nearly completely resolved, and she was back to her normal baseline status. PRES typically results in abnormal interstitial fluid accumulation in the brain, or vasogenic edema. This may be due to increasing hydrostatic pressure and/or increased microvascular permeability. There are two theories promoted to explain the pathophysiology of vasogenic edema in PRES: 1) hyperperfusion due to intravascular pressures exceeding their autoregulatory capabilities, resulting in breakthrough edema; and 2) hypoperfusion and ischemia due to excessive vasoconstriction that occurs as a response to high intravascular pressures.1 Endothelial dysfunction or injury is a common link that leads to compromise of BBB integrity and likely accounts for the extravascular leakage of contrast in the present patient. In conclusion, this case adds PRES to the list of observed causes of CSF enhancement on FLAIR. The observation of CSF enhancement in acute PRES from hypertensive encephalopathy provides additional evidence in support of abnormally elevated microvascular permeability in this syndrome. Accepted after revision November 5, 2007. The posterior reversible encephalopathy syndrome: what's certain, what's new?